overall, it was a pretty entertaining movie. despite the fact that it's about the relatively alien subject of football (aka soccer), the basic story is the same: young girl (jess, parminder nagra) triumphs over adversities to find herself by following her dream and in the meantime also fall in love. thrown into the story is also a tale of culture clash, that of her conservative indian upbringing versus the more modern progressive society with gender equality and more worlds opening up to women, including sports. jess' sister pinky represents her opposite: all she cares about is looking good and getting married to an arranged husband. despite her outward appearance of following through with traditional customs, she too is not immune to the pull of modern society, with her secret boyfriend that her parents supposedly don't know about. jess idolizes david beckham, popular british football player. jess herself is quite good at the game, which she demonstrates playing with guys at the park (much to the shock of her mother), and which catches the attention of jules (keira knightley), who invites her to tryout at the local women soccer team. into the mix throw in one hot young coach (jonathan rhys meyers), which, surprise surprise, results in a love triangle. spoiler if there's one thing i had some gripes about it's the whole dynamic of the triangle, it seemed a little too convenient that the coach would fall in love with jess, when in fact he doesn't really know her as well as he knows jules, who would be the obvious choice. also, jules is a little too quick to forgive after she discovers that she's the third wheel in the equation. but it's only a slight leap of faith that doesn't detract from the overall feel-goodness of the movie and caps the movie at a very satisfying and happy ending, which is the kind of films i like anyway. i wonder if the film has a stronger appeal amongst girls and women, who can perhaps more readily identify with the protagonist, along with the female comraderie. but there's also plenty for guys to appreciate, with numerous scenes of attractive female athletes (on the field, but also in one scene, out clubbing together after a game), though never shot in any gratuitous manner. a good movie to see, especially if you're in an indian movie kick like me. i can't wait for my next indian movie! 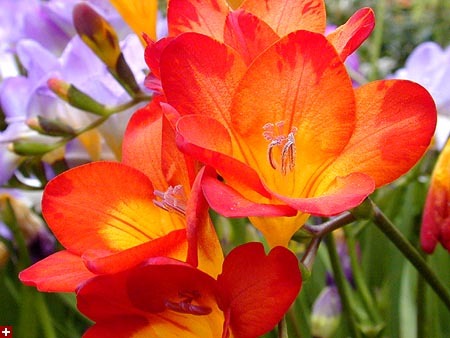 freesia! my new favorite flower! i went with my father to mahoney's garden store in winchester today, and saw them. well, more like smelled them first, a distinctive fresh and pleasant fragrance. 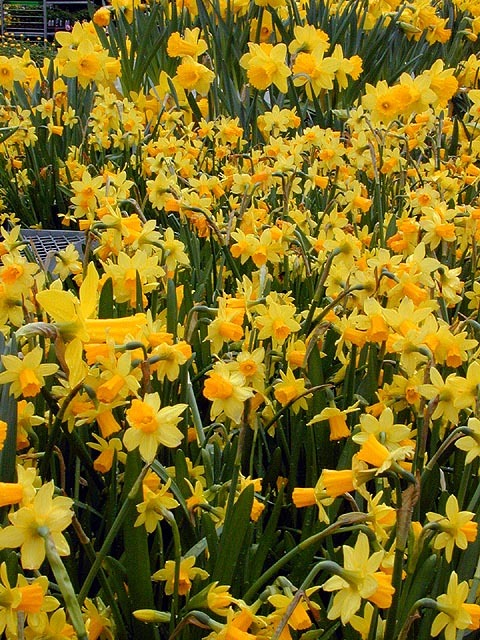 i remember eliza jones once said my bathroom smelled like freesia. never really knew what that meant, just took her word for it, but after having seen freesias for myself, there's no going back. i should've bought a pot of it, i need to go back and get some freesia to grow here at home. there was more flowers in mahoney's than i've seen outdoors, with this being a particularly harsh winter. garden shops are like the poor man's botanical garden, just like pet shops are like the poor man's zoo. and just like pet shops, the great thing about a garden shop is if you see something you like, you can actually buy it and take it home with you. my father was there looking for tomato plants, which we found out it was still too cold to grow them. instead, he bought two different types of basil (sweet and african), and 80 lbs. worth of manure, and a bag of potting soil for myself. 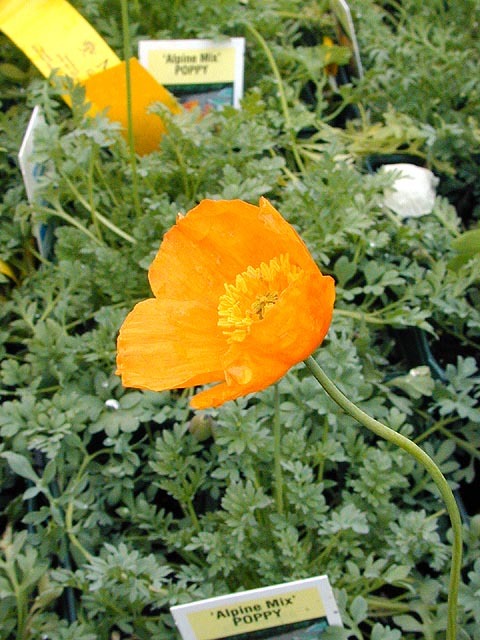 a garden store is also a good place to identity those hard-to-figure-out flowers growing in one's backyard. i finally discovered what those mysterious white flowers are, they're hepatica americana. also for future reference, there are ajugas (ground covers with purple flowers) and quince (thorny bush with pink flowers) growing in the backyard in belmont. 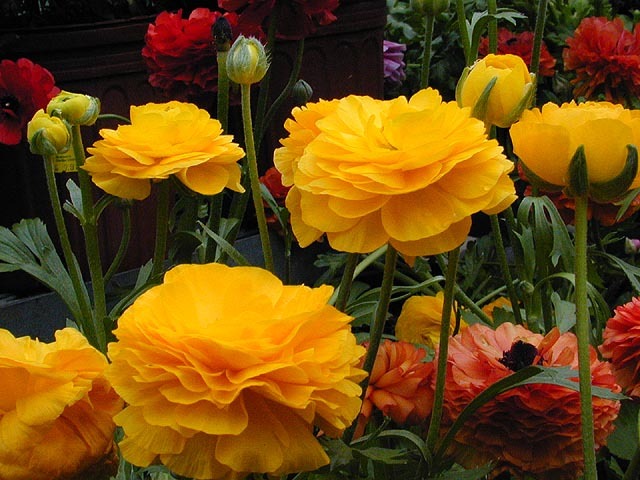 besides tables and wheeled shelves worth of spring bulbs like hyacinths, tulips, and daffodils, i also some some of my favorite flowers, anemones and poppies. 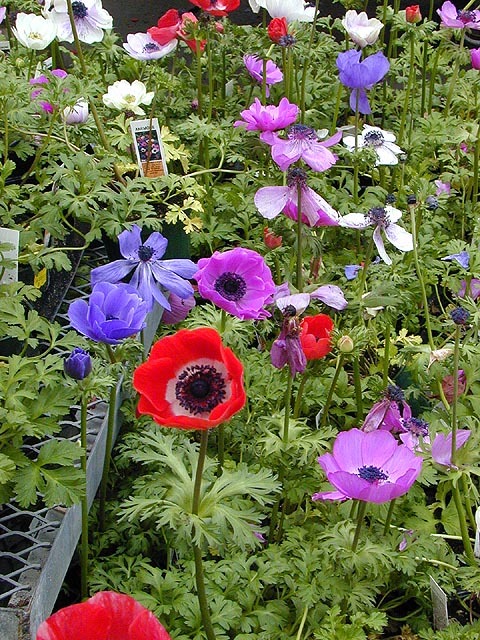 anemones actually bear some resemble to poppies, except you can only make opium from one of them. i actually think anemones look their best when they're still in bud form, before they open up and all the petals fall off. if i remember correctly, the anemones growing in belmont won't come out until may. 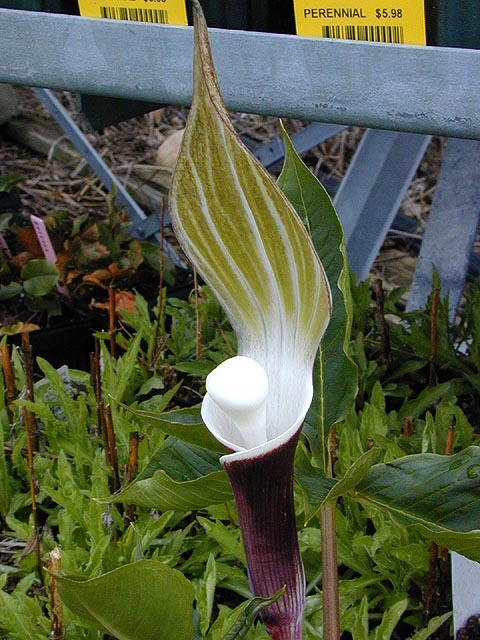 there were also jack-in-the-pulpits, their distinctive appearance hard to misidentify. they were selling for an incredible $50/pot. 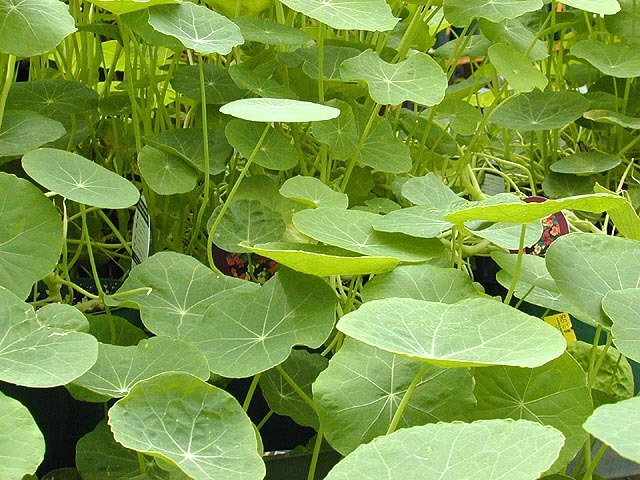 nasturtiums were also for sale, resembling a sea of waterless lilypads. lunch was a pair of hot dogs while dinner was a burrito with alex wong. a funny story that one, we called and said we'd meet at the mexican place. i was late (too engrossed in some last minute aiming), so i ran down to boca grande. i went inside, took a quick look around, and went back out to call alex, suddenly realizing what happened. turns out he was at anna's tacqueria, so i ran all the way to anna's, and sure enough, found alex sitting there finish his burrito. when i finally got my order, still slightly out of breath, alex coolly sat there, no apologies, no "sorry for the mix-up," taking sips of his soda as i ate my burrito. afterwards, he camped out at my place for an hour before he left, telling me how people in japan though he was blind when he walked the streets in his sunglasses and camera monopod. later that evening, renata came by to pick me up to go see bend it like beckham at the kendall cinema (9:15pm showing). we were supposed to go see it two weeks ago (030411), that night renata came over for red curry dinner and felt too sleepy to go see a movie. she honked the horn outside to get my attention (the ghetto doorbell), and once i was in the car, she told me how she narrowly got into a road rage accident and how this guy gave her the finger. neither of us thought there'd be very many people in the theatre (renata told me "two"), but we were kind of surprised to see about half a dozen, and then a handful more right before the movie started. i got a piece of her trident "princess gum" which lasted me throughout the duration of the movie. when the film was over, a cinematically satisfied renata drove me home, shimmying herself out the driver's side window to feed the validation ticket into the barrier release machine, before making a beeline to my house. thankfully, nobody flipped us off.